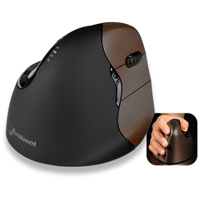 The Newtral 3 Mouse from Microtouch is designed to provide ergonomic support for the palm and thumb. The 33° outward angle of the mouse body helps to reduce pronation of the forearm, a common risk factor for fatigue and pain in the forearm and hand. 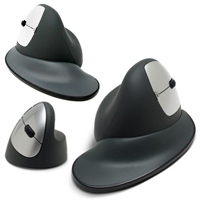 The design of the Newtral 3 Mouse encourages users to rest their hand on the mouse rather than trying to grip it. The Newtral 3 body is designed to provide an optimal "Precision Grip" for situations where fine control is necessary. The included "Ergo Grip Flange" attaches magnetically and elevates the side and heel of the hand, as well as the wrist, with an integrated gel pad providing comfortable support. This "Ergo Grip" configuration eliminates the need to maintain a grip on the device. Instead, the hand is held in position by gravity, and moves with the device. The Newtral 3 Mouse introduces functional revisions and performance changes from its predecessors, the Newtral and Newtral2, while still retaining the ergonomic benefits of the design. The most notable revision is the transfer of the second thumb button to behind the upper button - a more common position than the top/bottom layout of the earlier models. The thumbrest also has a deeper inset that fully sockets the thumb in place. The DPI button projects slightly higher which means it is more easily activated than on the earlier models. Button activation is still crisp and clean. The Ergo Grip Flange has also been enlarged to provide more space for the little finger as well as now supporting the entire heel of the hand. Overall the body of the mouse is slightly more "angular" in design, varying from the curved shape of the earlier models. No longer present is the "Balance Grip" flange option from the Newtral2. 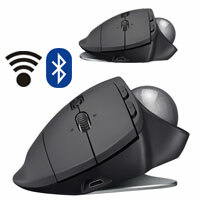 The Newtral 3 Mouse is currently only available in size Medium, in both wired and wireless format. 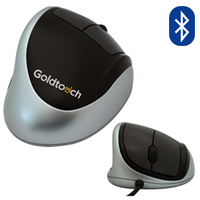 Both wired and wireless models offer fingertip access to multiple DPI settings (see detailed specifications for details) enabling users to choose the pointer response best suited to their needs and are fully user programmable (on Windows only). Note: Additional models of the Newtral 3 Mouse will be available later in 2019. Use this convenient Sizing Guide to assist in choosing the appropriate size of Newtral 3 Mouse. 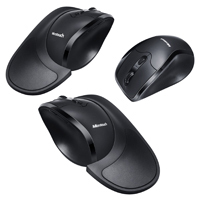 The Newtral2 Mouse from Microtouch offers new features and improved performance over its predecessor while still retaining all of the features of the original. 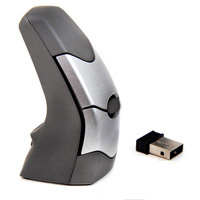 Designed to support the palm and thumb, the body of the Newtral2 Mouse encourages users to rest their hand on the mouse rather than trying to grip it. The 33° outward angle of the mouse body helps to reduce pronation of the forearm, a common risk factor for fatigue and pain in the forearm and hand. Three interchangeable flanges provide a surface for the little finger and outer edge of the palm to rest on, reducing friction and drag. The largest flange is a new addition to the Newtral Mouse family. This flange elevates the side and heel of the hand, as well as the wrist, with an integrated gel pad providing comfortable support. This new 'Ergo-Grip' configuration eliminates the need to maintain a grip on the device. Instead, the hand is held in position by gravity, and moves with the device. 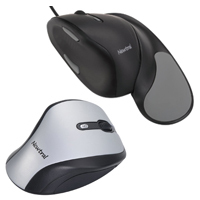 The Newtral2 Mouse is available in sizes Large and Medium, and in wired and wireless models. Both wired and wireless models offer fingertip access to multiple DPI settings (see detailed specifications for details) enabling users to choose the pointer response best suited to their needs. The wired model is programmable (on Windows only), and ships with a Windows driver CD to allow users to reprogram all six buttons. 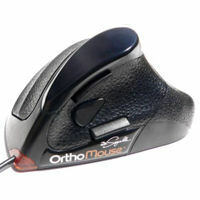 The Newtral2 Mouse is available for right-handed use only. Use this convenient Sizing Guide to assist in choosing the appropriate size of Newtral2 Mouse. Please Note: The Newtral2 Mouse is now discontinued and has been replaced by the Newtral 3 Mouse.